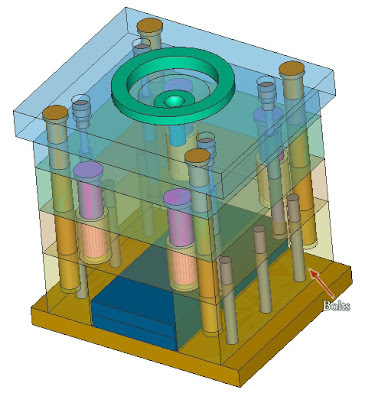 I take those topic, to start learning about kind of pin on 3 Plate Molds, becouse between 3plate and 2 plate mold have several different function of Pin. this pin is totally support cavity, and runner plate when molds in open,when we buy mold base plate from fabricator, they always have exact diameter of Support Pin that we needed, it was calculated, but if your part is precision ensure it by calculating the deflection of those pin caused by cavity plate and runner plate. make sure the deflection of pin not larger than 0.1 mm, choose more large diameter of Support pin when deflection is large. Because support pin doesn't precision when closing, we need more precision guide part, this part also named Guide Pin, becouse it will guide core and cavity matching together. use this part with the Bush, in high precision part, some times we need more than one Positioning Pin, we can also add block guide, taper block set, taper pin set and other high precision positioning tools. 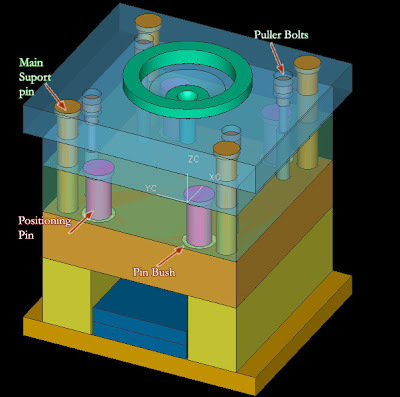 puller bolts doesn't support any plate, this part actually include in opening part of three plate molds. working together with tension link or magnet block, this part will make parting line at stripper plate and top plate, this parting line used to make sure that sprue was cut from nozzle. Parting line Opening is about 5-10 mm, depend on large of molds. look at picture below to learn the length of each Pin. Hi. How do you fix the runner waste material to the stripper plate, when the stripper plate and the cavity plate get separated? Great information by the way. Thanks a lot for your time.